Scroll down to LEARN MORE about each application. SalesForce.com, eat your heart-out! Too many of our competitors just don't understand the commercial and business brokerage industry like we do. There are companies like SalesForce.com providing great one-to-one customer relationship management, task list managers, and e-mail integration tools. But they just don't get our business! Ask SalesForce.com to build an application especially for you and you'd better be prepared to give them your child's college savings. What we do that they don't do is watch each buyer's move throughout the website and the platform alerts your agents when a buyer shows an interest in the property or business. As brokers know, customer relationships in the brokerage world are complex and not linear. A brokerage firms has many agents trying to sell many listings to many buyers dealing with many leads coming from many places. So the CRM must be able to manage those many-to-many complex relationships. We've got those relationships licked with our fantastic BuyerSmart Tools. It is all seamlessly tied together - listings to agents - agents to buyers - buyers to listings - agents to leads and more! Our unique platform is designed to capture buyer as well as seller information including the customer's name, address, e-mail and phone contact to be used for future e-mail campaigns. When you license our platform, you get access to market your listings to those 70,000 buyers and sellers, creating a buzz around your listings even before you start putting on other websites. This results in more deal done, making you more money! Our platform is designed to instantly provide our clients with the latest mobile website with Google approved webpages to help you get better rankings. The trend is growing toward more and more people going mobile in their searches for businesses. When your website is setup, we also setup your mobile site. It is no secret the broker who gets more leads will do more deals. That's what our SEOsmart platform does - it helps you find more leads - Buyers, tenants and owners. Each listing, each article, each webpage is SEO optimized and personalized by the broker to gain the highest possible search engine result in the industry. Often our platform will help the broker garner first page positions on Google, Bing, Yahoo! and Ask. This tool will also generate landlord and business owner leads as a result of the SEOsmart technology behind the articles and key webpages. One of our clients get more than 500 business owner leads a year from our platform! Let's be clear here - these are business owner leads whereby the business owner seeks you out because they want to sell their property or business and they find you by doing Google searches, where you'll often be on page one related searches to selling their property. The biggest complaint a client has is "my broker never calls or contacts me so I have no idea what he or she has been doing." Our platform resolves this issue once and for all by delivering automatic weekly/monthly/quarterly listing status reports that monitors the listings views, confidential agreements signed, number of buyer/tenants contacted and number of direct ad inquiries. In addition, the system also keeps the client in the loop with buyers and tenants by delivering buyer/tenant contact e-mail notices to the client on broker's demand, helping the broker keep the client in the loop. This clearly leads to higher client retention rates and therefore higher listing renewal rates. Good buyers/tenants are hard to find unless you've got the BuyerSmart technology working for you. Our platform insures every buyer or tenant who shows a certain-level of interest is serviced by the agent. This means the technology is watching every move the buyer or tenant makes and then notifies the agent via e-mail of movements that indicate more than just a casual tire- kicker. Then the broker contacts buyer or tenant right on their smart phone and once they've made contact, the broker types a note about the conversation and if the broker so elects, the client will get an e-mail alert about the contact. And to make sure the broker is on top of this customer, there is a task manager whereby the broker can setup an e-mail alert to remind the broker to call the buyer. Making sure your agents use the latest forms and contract is critical to protecting yourself in this litigious society we live in. Our platform provides you with an area where the broker uploads the latest forms and contracts. Agents can then quickly download and print them for use. Our Listing Setup Manager is simple and easy to use with just the right amount of information to entice a buyer or tenant to register on your website so you can begin to capture critical buyer information. Each listing has 11 critical information folders such as the written ad, the Seller's information, operating data, lease and real estate data, financial data, photos and videos, and specific SEO tagging designed to help people find your website. Listings are setup fast and easy and ready for market in minutes. In the ever-fast growing global concern about wasting energy, we at BBMT, Inc. are way ahead of the curve! While others talk about reducing paper, we've eliminated it! How much time is wasted looking up relevant documents for your listings? Printing documents? Or worse yet faxing documents to clients while fighting the fax machine because it didn't connect or missed a page or two? Now we've made it fast and easy to scan, upload and attached documents to your listings for easy document management and control. Get the lease or profit and loss statement to your client in a click via e-mail. These documents are permenently attached to your listings for as long as you subscribe to our services. So you don't have to store all those documents in expensive storage facilities. Just scan and upload, and save lots of money! And if you want a disk of the documents, then for a small service fee we can provide that to you as well. People today want more than a picture and a paragraph when doing business with a complete stranger. They want to know what the broker has accomplished, what they've sold or leased, who's given them good testimonies, what videos and photos the broker has on their properties and finally what articles the agent has published and whatnot. 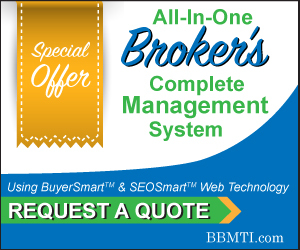 Well our BBMT platform does exactly that for each of the broker's agents. You'll help make each of your agents seem more human to a Seller or Buyer when using the BBMT platform. Control Your Marketing and Advertising Messaging! How many times have you had a new listing or a price reduction and you're ability to notify all potential customers is limited to whatever Loopnet.com and BizBuySell.com do in terms of market...which is nothing! Well our platform gives you the power to control your messaging to your buyers and tenants. Our platform is designed to collect consumer data, and it does it so well that in less than 10 years we've had over 70,000 people come to our platform and register to receive our marketing alerts. THAT'S POWERFUL WHEN YOU'RE MARKETING THOSE PRICE REDUCTIONS TO THEM! You can create immediate and professional looking newsletters as well as listing alerts in seconds and ready for Constant Contact of Vertical Response e-mail blasting programs. Enter the listing numbers or article numbers into our e-mail and newsletter builder and within minutes you'll have a professional looking e-mail alert that you'll be proud to display! Nothing kills a broker's time more than receiving, filing, inventorying and keeping track of confidential agreements (NDA's) signed by buyers and tenants to protect your commission. Let our system do the work for you. Our patented process takes all tracking of NDA out of a human's hands and into the digital world. Our On-line NDA system requires a buyer or tenant to digitally sign a confidential agreement for each listing. The system sends the NDA to the buyer or tenant and then saves it for future viewing by the broker. There is no confusion should you change the NDA language, because our platform knows when you do and it tracks each change to each person who signed the new version as well as the old version of the NDA. Education is the key to success and BBMT, Inc. gives our clients the opportunity to create a robust educational center that contacts artices as well as videos to help your agents get better at what they do and to keep them on top of industry trends and changes. We've designed our educational center to have a look and feel much like Yahoo.com. It's eye apealling and fun. Our platform generates reports including sales history such as cash flow multiples, revenues multiples, days on market, buyer leads sources, seller lead sources, listing performance by agent, listing lead convertion by agent and much much more.